This Severus Snape photo might contain esstisch, brasserie, urlaub abendessen, feiertagsabendessen, and weihnachtsessen. ♪♫♪A wizard's staff has a knob on the end, knob on the end, knob on the end. 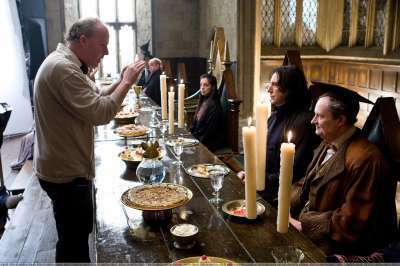 What he does with it is magic!♪♫♪"
And then Severus is probably thinking "Just kill me now!" Sorry, couldn't resist it when I saw that pic. Is that Minerva Mcgonagall in the middle? No, that's not Minerva, though I can not at this moment recall who she is. That pic is bloody hysterical. Alan looks bored stiff as if to say "I am the greatest Thespian, please dont tell me how to act!!!"